A great indoor range round that doubles as a very solid specialty round for home defense or other personal defense needs from the .40 S&W perspective. 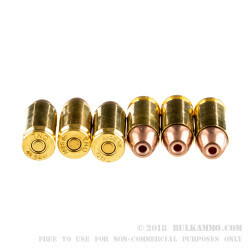 This is a frangible load that is based on SinterFire’s proprietary design that utilizes a sintered metal bullet and prioritizes the green aspect of ammunition with reduced heavy metals and clean environmental considerations. Sintered metal is essentially a powdered metal that is compressed under tremendous pressure so that when it impacts a target, it breaks apart in almost the same way an atomizer works for perfume. The dissipation effect means that the bullet doesn’t have the same deflection or overpenetration concerns that other bullets have. 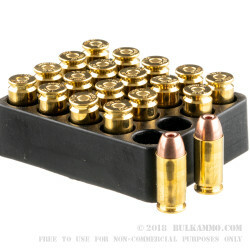 This is a 125 grain frangible projectile loaded in a reduced heavy-metal cartridge that utilizes a brass case and a premium primer as well as a thorough burning powder that leaves little excess unburned. The idea is that a shooter can get a better experience through less smoke, lead exposure, and obvious potential risks (like deflection and ricochet). Many indoor ranges require you to shoot a frangible round for ricochet prevention; or to shoot lead free rounds, which this load is. 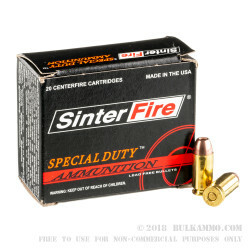 With the increase in occurrences for this type of regulation (governmental) or requirement (by the business) the SinterFire concept and by extension the brand, becomes a good option for most shooters to entertain. 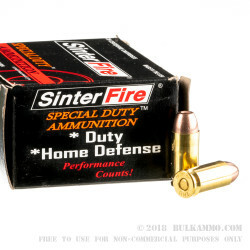 A: Hello TG, Sinterfire lists this round as a "Special Duty" round as they are a hollow point frangible style projectile. They list the muzzle velocity of this round at 1350 fps.